Welcome to Leatha’s, enjoy your stay… Thank you kindly for comin’ this way! 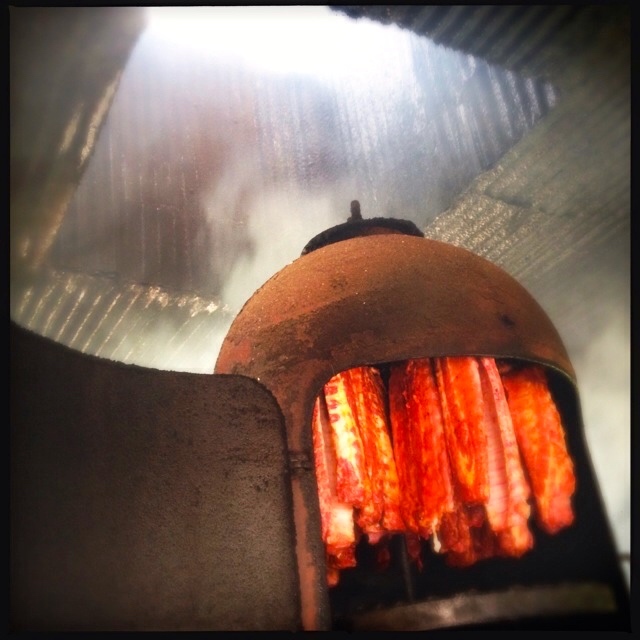 You pull up to a gravel and dirt parking lot, and see that the smokehouse is nearly as large as the restaurant. That should tell you that they’re not playing around here. As you leave your car, a deep breath tells you that the wafting blue smoke is from pecan wood, light and fragrant. It’s my favorite wood to smoke with. It’s not spicy like hickory or mesquite, or sweet like cherry or apple. It’s the most even-handed of woods to smoke with, and can be used for any type of meat. Leatha’s is in an old meeting hall which still looks like grandma’s house, which it should. This is their second version of the restaurant. It started out about 40 years ago in Leatha’s house. This is Ms. Leatha. Ms. Leatha still keeps a watchful eye on things. As I heard it, Leatha cooked in the kitchen and taught her husband to cook on the grill outside. Leatha’s skills in the kitchen allowed them to dream of a larger place, and over two years, her husband built their first restaurant. As they got bigger and more popular, it became necessary to find a new place, and so they moved to this meeting hall sized building up off the highway. And they took everything they could from the first restaurant, including tables, pictures and even the kitchen sink! It still looks quaint. It has a wooden porch wide enough to relax on, with great broad steps perfect for sitting on or for taking a quick picture. 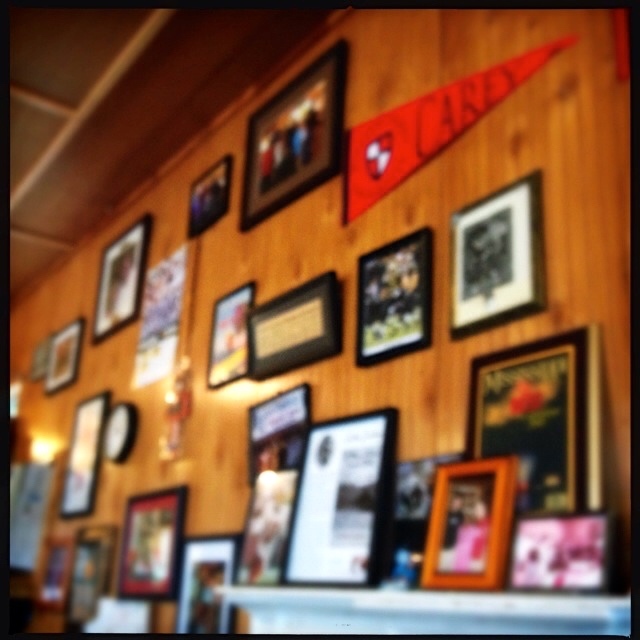 … and walls covered in photographs and awards. The kitchen is at the far end, as is the checkout stand. Just seat yourself, and they’ll bring you menus. 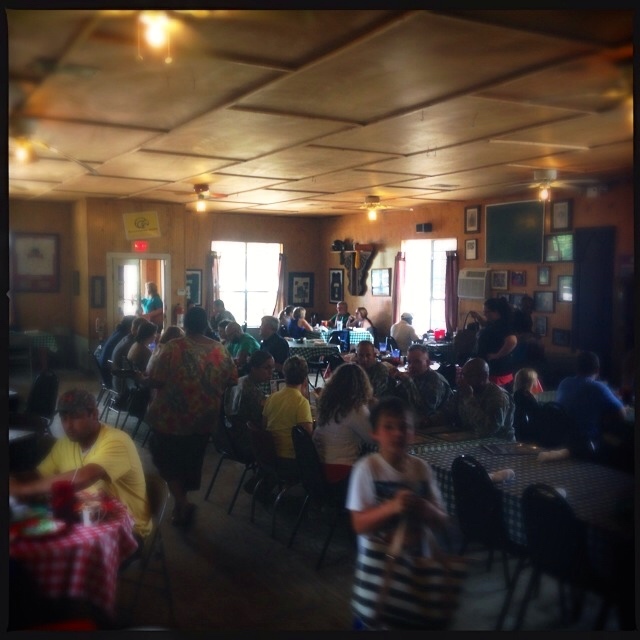 Leatha’s was full of families, couples, and working men. And from the folks running in and out, they do a busy takeout business too. 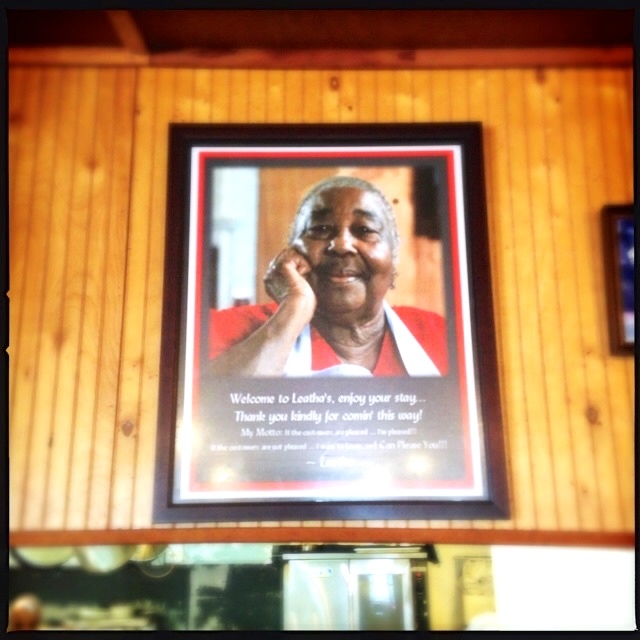 Here’s a picture of the back kitchen, and a memoriam to Ms. Leatha right over the kitchen door. Now I’ve always been a big fan of barbecue places that put a roll of paper towels on the table. That’s a good indicator of just how messy it gets, and that it’s ok. Just sit right back and enjoy yourself. Leatha’s takes this to a new realm: instead of paper towels, you get an actual towel to keep yourself clean. This pretty much blew my mind. 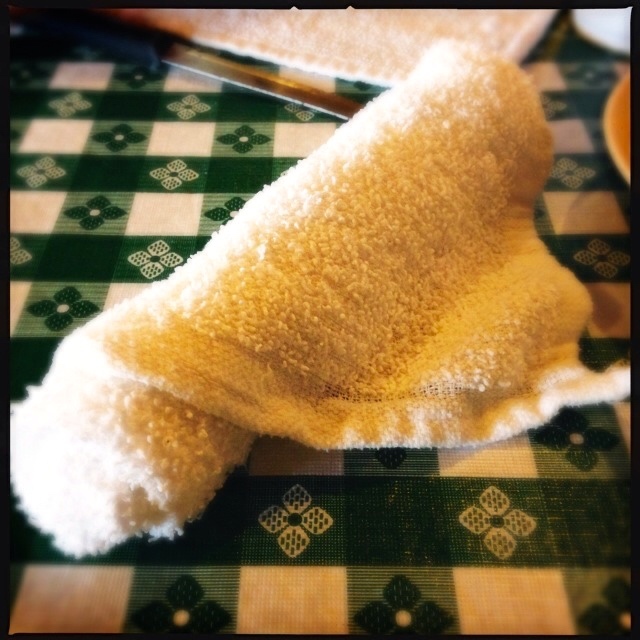 That’s a great idea…instead of having 15 dirty, greasy, crumpled up paper towels at the end, you have one, nice, not-so-white-any-more towel to fold up neatly on the table. It’s like a wetnap and a paper towel all in one. Genius. Leath’s Special comes with your choice of two sides (fried potatoes, “Secret Recipe” slaw, baked beans, green salad, coleslaw, and potato salad). 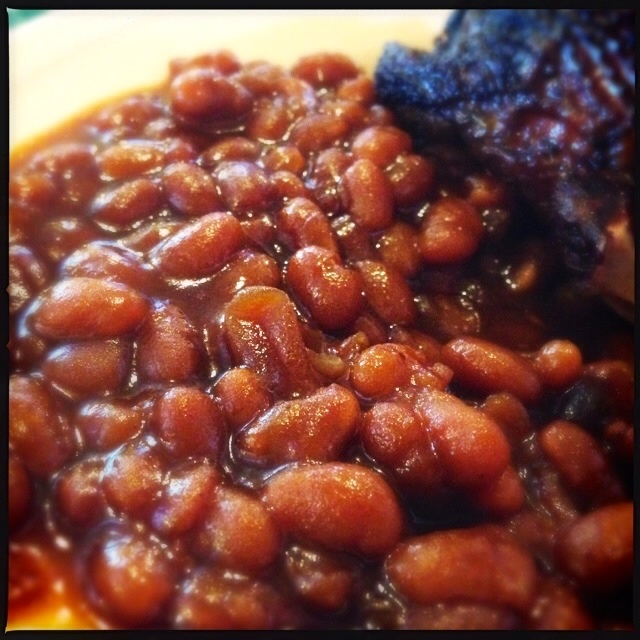 We chose the baked beans and “Secret Recipe” slaw, then added an additional side of fried potatoes. Oh man, don’t miss the fried potatoes! They are cut into quarter inch thick half moons, and are so crunchy and crispy on the outside that they must be fried in lard, or by magical elves with magical potatoes and magical oil. They’re that good, and worth a special trip just for them. I wish they delivered to Little Rock. Yum. The “Secret Recipe” slaw came out first. 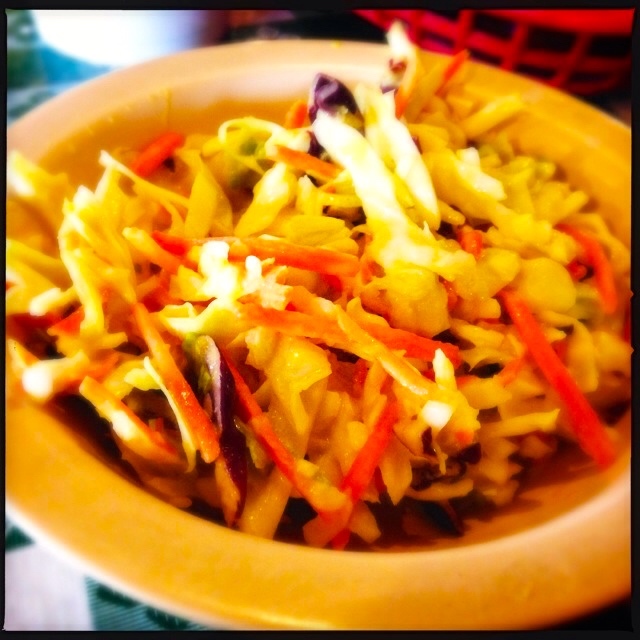 It is your standard green cabbage and carrot slaw, but has a light honey mustard and cider vinegar dressing. Truth be told, I thought it could have used a little salt and pepper to boost the flavor of the cabbage and carrots, but we ate it all. I understand that it’s very popular, but I’d probably skip them for the fried potatoes the next time. 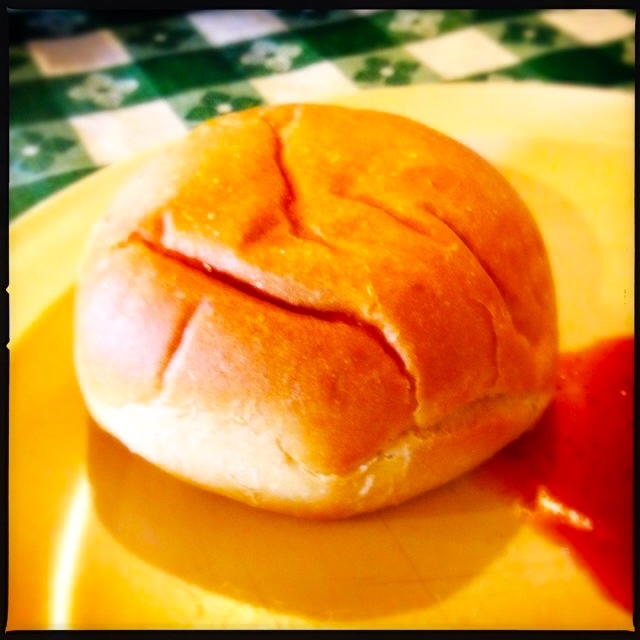 Lunch came with white rolls and a jug of barbecue sauce. There is a long history of white bread and barbecue, running back what must be hundreds of years. It’s a standard accompaniment for barbecue, either on the side, or under the barbecue itself. Sometimes its white bread, other times it’s a pillowy yeast roll, or even corn bread (but never put barbecue on top of cornbread!). Leatha’s rolls were fine, pretty much your standard dinner variety rolls. 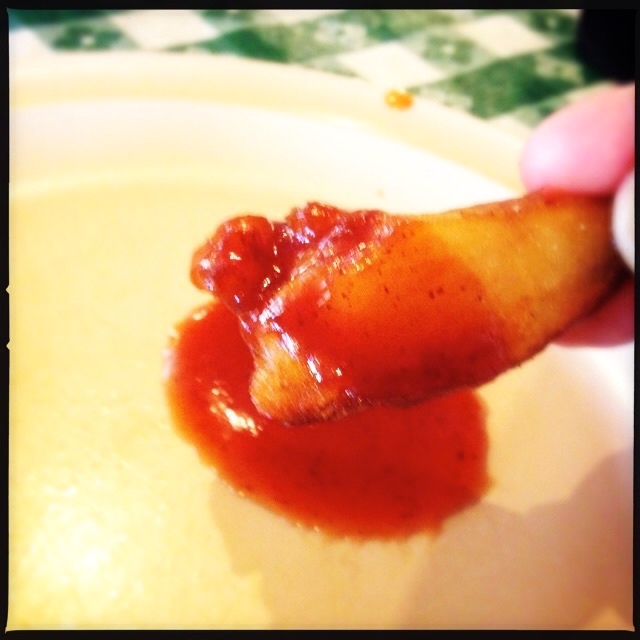 I took a bite of one so that I could tell you about them, but I’m telling you that you can just save room for barbecue and fried potatoes. On to the barbecue. 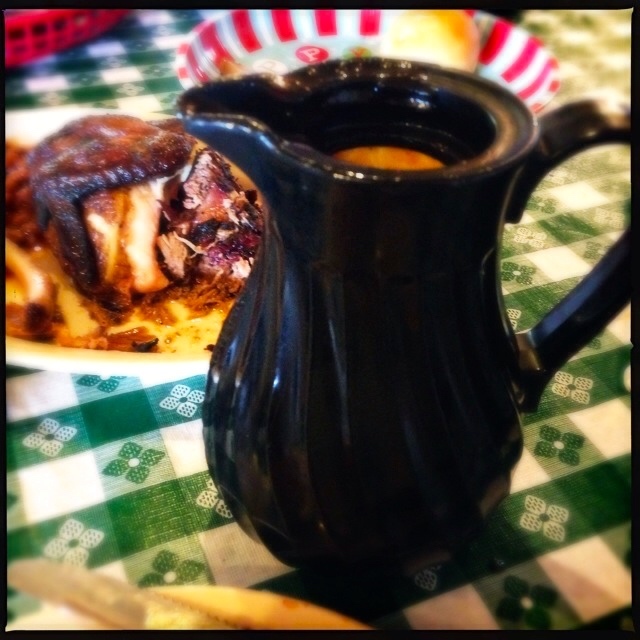 Leath’s Special comes on a platter, with several beef ribs (no bones, geez those would be ginormous! 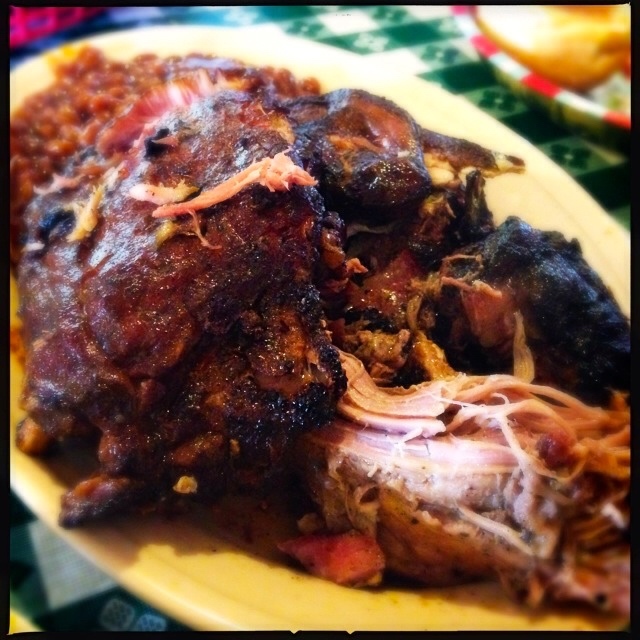 ), about 5 pork ribs, a nice pile of pulled pork, and a quarter of smoked chicken (we received breast and wing). It was enough food for the three of us meat eaters. The beef ribs were the true show stopper. Deeply smoky, meaty and rich. They tasted of the best steak, with intense, delicious beefiness. They pulled easily, without being mushy. We fought over them, but all of us won because there was plenty. These were the best beef ribs that I have ever had. 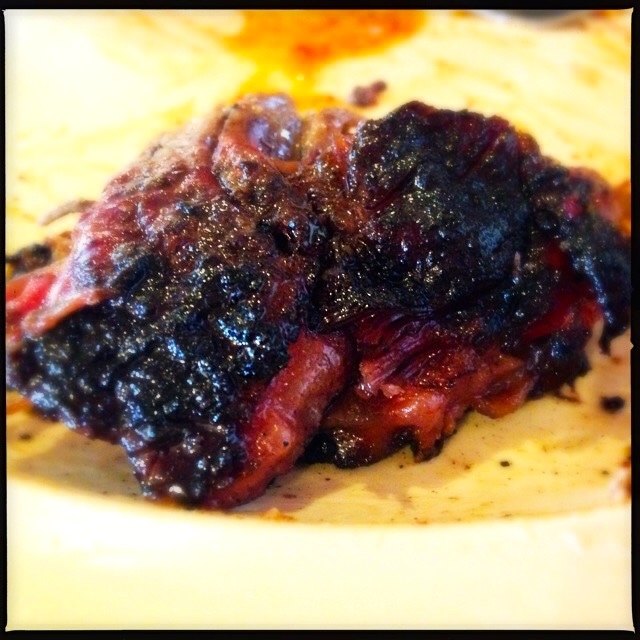 I still dream of these beef ribs. 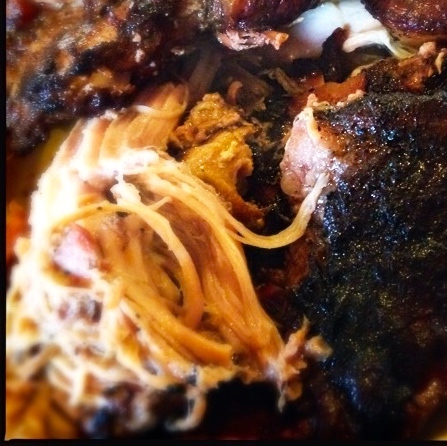 The pulled pork was insanely juicy, so juicy you wonder how that was possible. Tender, easy to pull in great long juicy strands, and it just melted in your mouth. No sauce needed on this. It had a great bark and a nice medium smoke. 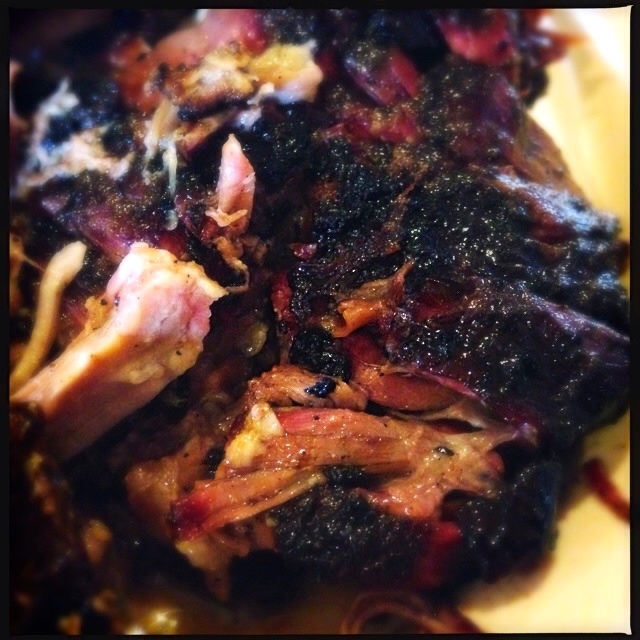 This was the very best pulled pork I have ever had (and we have great pork barbecue here in Arkansas). Just amazing. 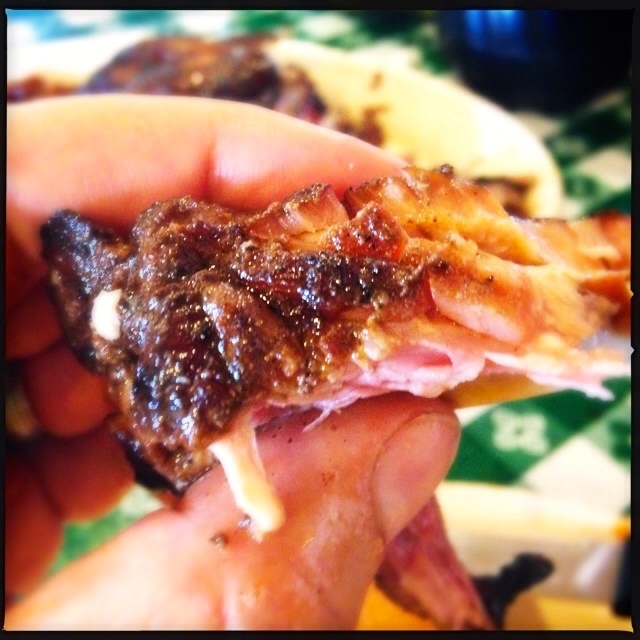 The pork ribs were cut St. Louis style, and had a nice glaze. The pecan wood left a pretty pink smoke ring, and they pulled easily. They were fall-off-the-bone tender, so they were a little bit more tender than I usually prefer. These were tasty but I have to tell you, after the beef ribs, everything else paled in comparison. Including these. 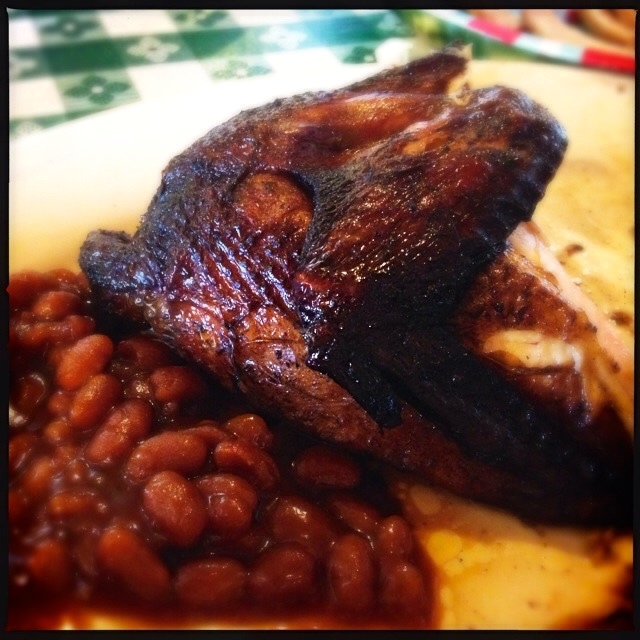 The least impressive part of the meal was the smoked chicken. We had the breast and wing quarter, and it was dry. I would suggest ordering the leg and thigh portion, which will likely be terrific. This just went a little too long in the smoker. When I smoke chickens, I either brine them first (which is the best option) or I cut them into quarters so that I can remove the breast sections earlier, when they hit temperature. If you smoke them until the leg quarters are overdone, you get what we had today. Dry white meat. But oh, boy, look at how pretty this chicken is! When I was paying up, I asked if I could go visit the smoker. I just love to see where the magic happens. 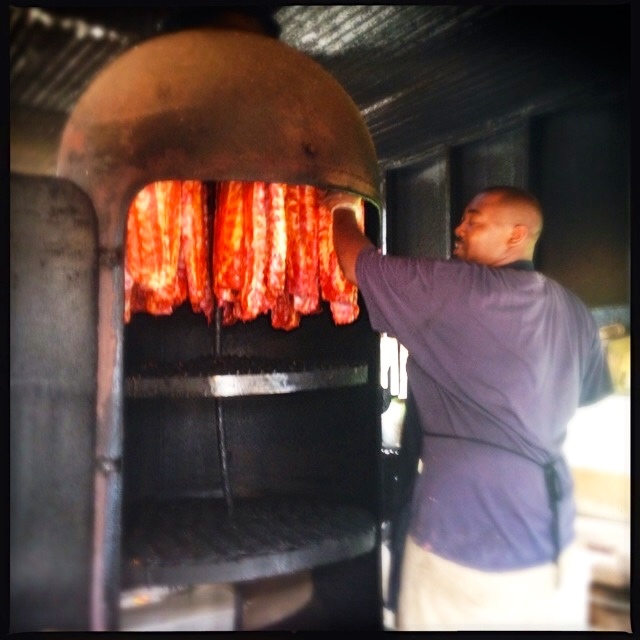 They said yes, and I went out the side door to see Brian, who has been the pitmaster for the last 13 years. I caught him hanging ribs in the smoker, all St. Louis cut. He was preparing a catering order for that night. This smoker is huge. It is an iron vertical smoker with an offset fire box. To give you an idea of how large it is, Brian is at least 6 feet tall, and was standing a few steps up on a stepstool in the above picture. Here is the top of the smoker, where the smoke curls up and out the roof. And provides a great way to find this place from the highway! They use pecan wood from a local place, and Brian chops it down to size with an axe. 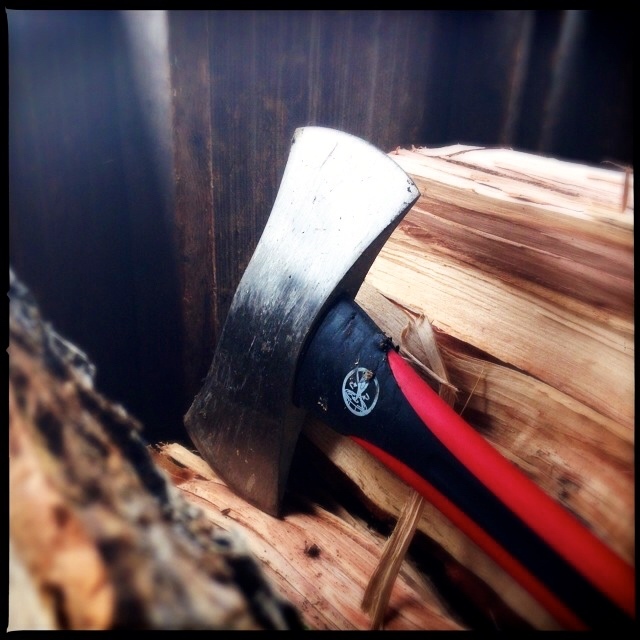 I love seeing a real axe at a barbecue joint.They don’t mess around here. The fire box is large, about 6 feet long and two feet high. He builds a nice fire and keeps feeding it all day long. 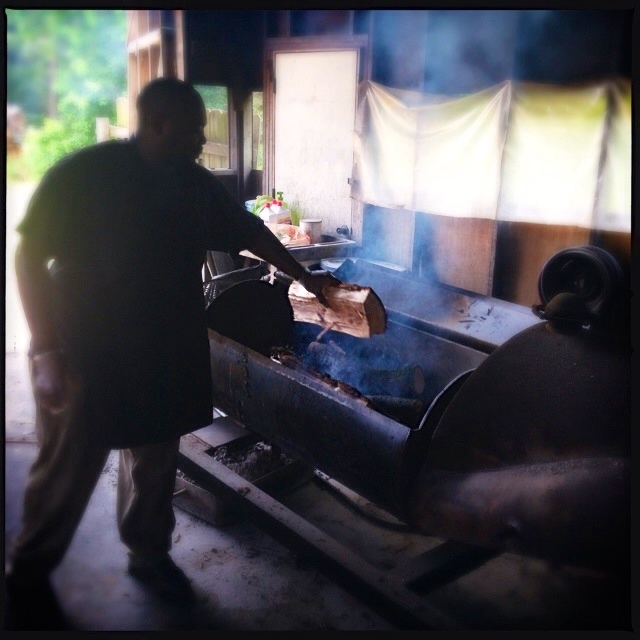 Brian was really proud of his smoker, and walked me through how it was made. 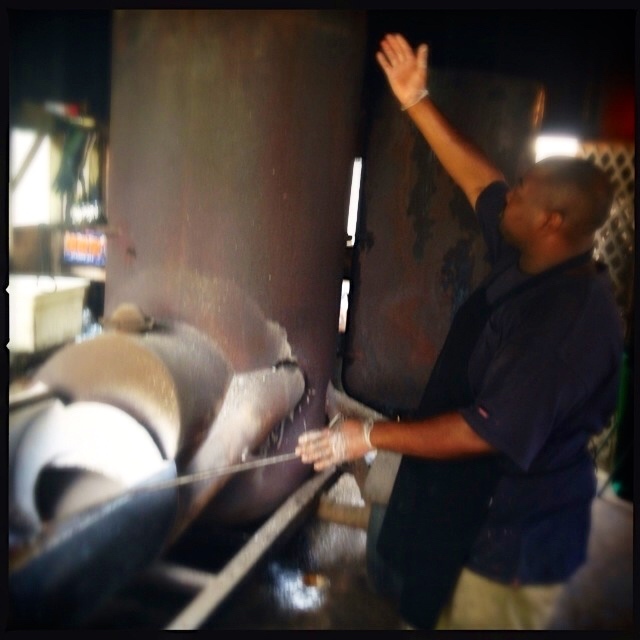 After using it for a while, they had extra tubes added between the fire box and the smoker, inserted at an angle, to get the smokiness they wanted in the meat. I really liked how they thought about that problem and then got it fixed. It tells you a lot about how they think about the business. Brian seasons and mops the meats as needed. 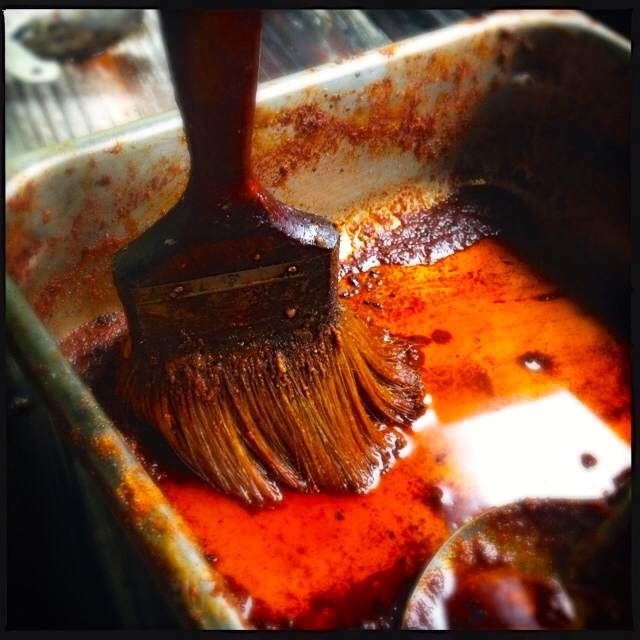 They use a standard seasoning salt, and their barbecue sauce to mop. I love how they use a real paintbrush to do that. Brian and I talked back and forth about the merits of using nylon versus natural bristles, and agreed that natural bristles are the way to go. Here’s a final picture from the smokehouse. Brian’s chair. I just love that. You can tell that chair has been around a good long while. 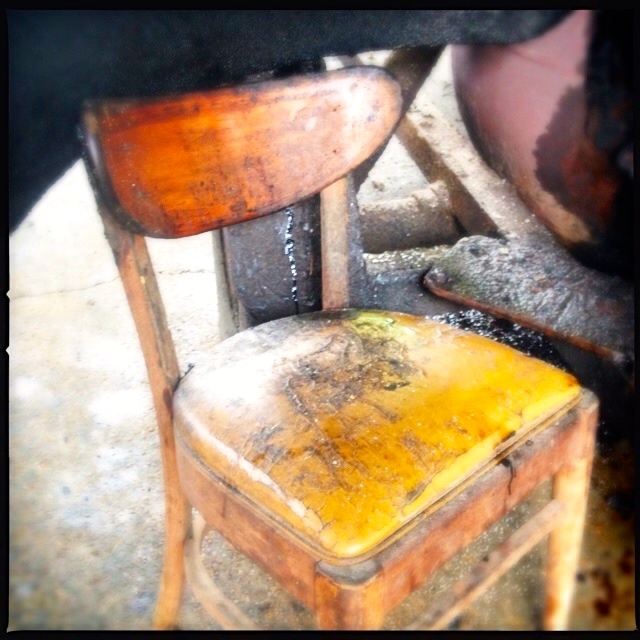 I bet it came from the old Leatha’s, and may well have been the chair that his father sat on, on the back porch many, many years ago when the business was just getting started. I like to think it is, anyway. On the way out the door, I paused on the porch. They have a mighty fine collection of porch pigs. This helps explain the kind of place Leatha’s is. 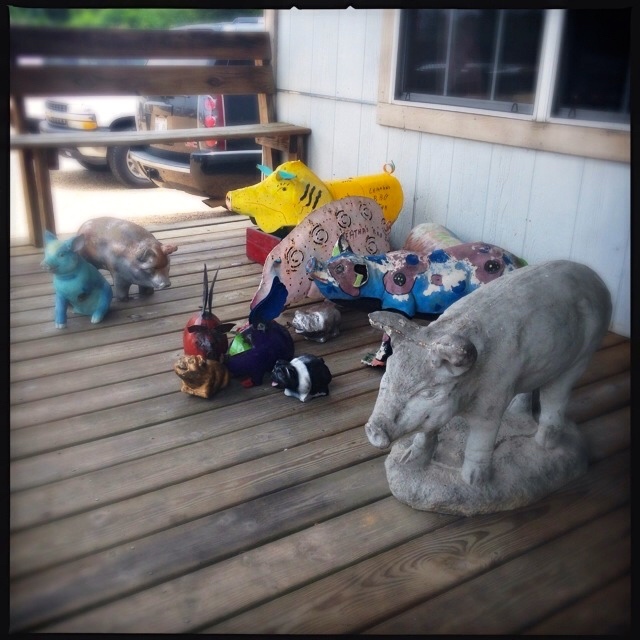 The kind of place with kind people that have porch pigs outside their fabulous restaurant.